The experience of humanity is driven and defined by our own consciousness, which is a product of our sophisticated brain functions. We are consciousness in every way shape and form. Control of this miracle of consciousness is sought for by a few individuals who are actually suffering from a mental (disconnect) disorder. What psychiatrists sometimes refer to as the psychopathic mind. Unfortunately, one of the characteristics of being a psychopath is that the individual exhibiting the psychopathic behavior has little to no insight into their own actions. In this example, we can say that the 'consciousness' is missing from the equation. This insight to one's own behavior is also a reference for distinguishing who might be considered "normal" and who might be considered schizophrenic "impaired" or "abnormal" This might lend perspective as to why groups of people (as opposed to individuals), such as governments and corporations, are capable of acting and speaking as a group in ways that are destructive to consciousness and mental and spiritual expansion of our species. Ironically, when an individual acts the same way, he may be considered impaired, but groups however, will get a pass thus allowing (immune) group entities to implement such damage on the species. One could measure this phenomenon scientifically by documenting physiological body changes that occur when humans are exposed to images or ideas that reflect 'non-consciousness' related items (images of war, government oppression) versus measurable body changes seen when exposed to consciousness related items (love, compassion, human rights issues etc). Basic vital signs such as heart rate, respiratory rate and blood pressure, also brain wave spikes readings, magnetic or tomography images are all factors and signs that might be measured to compare the human physiological responses to the concepts of non-consciousness-related reality versus consciousness and higher purpose. Governments would have us think that it is protecting humanity from itself. This non-conscious force we call government gets its life-force from an artificial set of rules called the legal system which non-conscious government would have you think is the script that your reality is not only based on but controlled entirely by. This is like someone walking into a room and notifying everyone in the room that their consciousness and state of awareness of existence doesn't exist any more. What? You can take someone's money and belongings, and even forcefully do harm to them and imprison them but how can you steal someone's consciousness? Government's answer to this? By eliminating it or ignoring its existence. This is one of the prime realities about the concept of government and any group efforts that steal the individual human being of his/her natural state of conscious equilibrium. This is a crime like any other crime, being committed on that individual human being. This can only be appreciated from the stand point of third party looking down on the species as a whole. When you consider it in this context it is then easy to appreciate this reality. It then becomes easy to see how non-conscious government concepts act as a cancer to the species. With humanity now swimming in knowledge about itself thanks to technology and the internet; knowledge which can no longer be ignored, we are only now beginning to see the early results of what happens when truth, awareness and consciousness is triggered by a massive pulse of lies which jolts the consciousness of the species. Edward Bernays Propaganda Effect Now Backfiring? With the current global awakening now accelerating at speeds that must not be pleasing to the globalists gangsters, it is reasonable to reflect back on the concept of propaganda, group think and group manipulation for the purposes of a certain agenda. I would like to suggest that it is possible that the global awakening we are seeing may partially and indirectly have been contributed by Edward Bernays himself. After all, it was Bernays who admitted openly how these mass mind control techniques were A: Real; B: They worked; C: They worked on the masses because they worked on the individual in an actual or perceived group setting. Bernays showed us that humans responded to clever timing, images and messages that appealed to our subconscious urges, imagination and thoughts. Can it be that we are seeing the culmination of many of these factors backfiring against the new world order plans. They hoped to continue to fool everyone with their propaganda. They planned and executed false flag operations and reinforced them with their planned propaganda, precise-timing talking points, images and sensationalism. But did they ever consider that the propaganda effect would actually wear out after so many decades of continued obvious lies and hypocrisy? Perhaps they did, and perhaps that is why there is so much talk about depopulation as seen in their own Georgia Guidestones. Perhaps the talk about how much "easier" it is to kill a million people by Zbigniew Brzezinski is an admission that they know humanity will wake up as a whole and perhaps this presents a last resort for the psychopath globalists before they must face their doom. I believe this is all the end result of hundreds of years of propaganda now fully exposed due to the information age. One thing I'll say about Bernays is that he never hid what he was doing. He told you straight forward what he was doing, even writing several books about it. The global political events we are seeing exposed in real-time are a first of its kind. Because of all the released information and knowledge and because of the internet, we can track the crimes of the elite in real-time in a rather exciting way which has led to the alternative or 'New Media'. What started off as a truth movement with many little cousin movements all around the world has morphed into one big freedom and consciousness movement. Thankfully, many of the lines that separated us have blurred as humans recognize that they need to come together more than anything else. Humanity is responding to this opressive non-conscious force we call government, by coming together and slowly ignoring our political, religious and philosophical differences and instead focusing on the common threat of the governmental control system. This is at the root of all of our struggles. We hear TV pundits tell us that humans must be controlled by a federal and global unchallenged government. It's no surprise many of the script-reading advocates for the big government top-down control system just happen to have significant voices in the mainstream media. No one at mainstream media dare stand for freedom and individual sovereignty. Anyone who does ends up getting fired or asked to quit. Hollywood TV shows as well as the educational system are all supporting the paradigm of big government. Obama's primary message to Americans seems to be about not listening to those (lunatics? radicals?) that stand for individual freedoms. Obama may actually be the only U.S. president warning America not of tyranny and the need to stand for the Constitution and Bill of Rights, but instead he's warning his sheep to beware of those warning of tyranny. One of the things the globalists have accomplished is they've made it easy to identify those who are with us and those who are not. Given the current global awakening in light of all the information and spiraling propaganda mentioned above, we can now simplify the battle field in such a way that it is easy to identify the enemies of freedom. We can now ask anyone the simple question: Power to the state or power to the people, which one do you choose? Will you side with those that demand freedom and sovereignty from government or will you side with those that feel the people are the property and responsibility of big government and those who rebel are terrorists? The state or the individual? Choose one and take sides now. We know where NBC stands, and CNN and all the left wing Obama supporters. Despite their attempts to sound pro-America, we know where Fox News and the Republicans stand also. When measured with this simple question of State versus Individual it is easy to see that both Democrats and Republicans are exactly the same. They are both controlled by criminal elements in the .1 percent class who want their one world government. It is then easy to see how the human element of humanity that is living and breathing, is now fully awakening to this non-consciousness element we've been calling government. Now we can observe how humanity will deal with this force that has cycled its way into an over-sized oppressive control mechanism. Humanity is now realizing that freedom is more a realization than anything else. Yes, realizing something is an expression of consciousness and learning or integration of knowledge and the awareness of this newly acquired knowledge. With humanity now realizing that government is a useless obstacle in the way of human thriving and freedom, I expect we will witness phenomenal things in the coming months and years. I see humanity now actually slowly but surely pulling together in an all-out effort to save itself from government. This is where we are. The expression of this reality we are now seeing in many freedom lovers world wide. This was essentially the very same spirit behind the founding of America. This was the spirit behind the Constitution and Bill of Rights and the primary meme of those initial years when America was founded. It doesn't mean that the founding fathers were saints or any of that, it means that the spirit of freedom that drove them to do what they did is back, in fact this modern day rekindling of freedom is and will be much more intense than what the founding fathers imagined. Humanity is now realizing it didn't finish the job. There is already a track record for getting this freedom thing done and this track record is serving as a precious guideline for those of us who are new at this. Let freedom ring and I look forward to witnessing the end result of this focused effort now closing in on government. No, no one was injured in the writing of this article. Not a shot fired. Consciousness knows no violence and the desire to thrive and be free is a realization. This battle is strictly mental warfare (as Bernays would have told you) and the transition from rooting for big government to control the people, to empathizing with your own species and connecting with other humans in a conscious way to exercise and celebrate your individual freedom from government is seamless. Awakening from the matrix cannot be measured with blood, bullets, drones or violence. 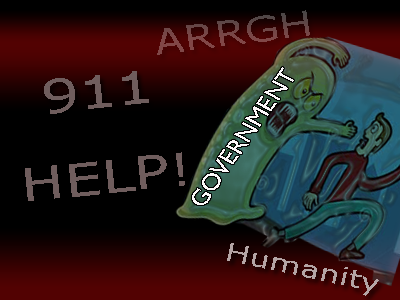 It (the individual's awakening) can only be delayed with fear, external, engineered, artificial, government-crafted fear. This awakening is being triggered by the realization that the fear of tyranny is much greater than any artificial fears the government can come up with. The human awakening has thus triggered a long awaited re-prioritizing of fear within the species, which is rendering the globalists primary weapon of mass deception obsolete. To think, we need only overcome their engineered fears to render the concept of over-controlling big government obsolete. Once we reach this point (and we are very close) we can then focus more on officially implementing all the solutions to the new world order at a mass scale. Till then, mass knowledge of solutions are now spreading globally as part of the awakening despite the fact that many of the solutions are still being contained by government using fear and and intimidation. The day is soon coming when these barriers of fear will dwindle as more and more people resort to being the change they want to see in the world. It's already happening and it's a wonderful thing to see.